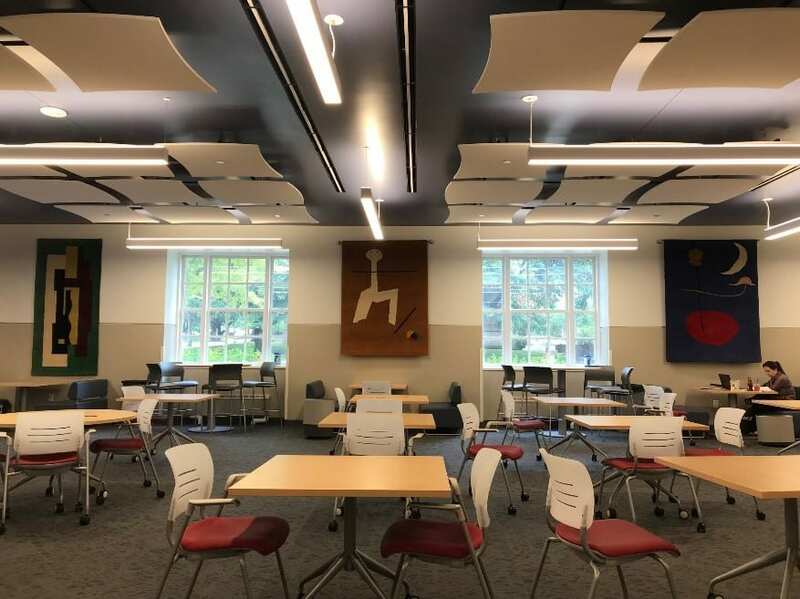 The Modern Masters Tapestries series, which hung in the DeGolyer Library Reading Room before Fondren’s completed renovation in 2016, is now on view in Fondren’s Collaborative Commons and other areas of the library. 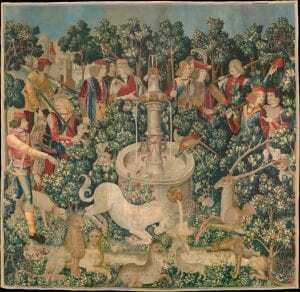 During the Middle Ages through the Renaissance (14th to 16th centuries), tapestries became commonplace in homes. In buildings with little insulation or heat, tapestries served the functional purpose – keeping the elements out and the heat in. Tapestries also served a secondary purpose – to display a sign of wealth and beauty. Like paintings, tapestries adorned the walls for those with financial means. Commissioned artisans were employed to design intricately woven designs in many of these tapestries, often creating beautiful mis-en-scènes or arranged scenery, that transported viewers to otherworldly lands. One of the most well-known series of such tapestries is the ornate seven-piece series, Hunt of the Unicorn, on display at the Cloisters in New York City. Even after centuries of exposure to sunlight and temperature, these 15th-century tapestries remain remarkably striking. What was once considered craft is now seen as fine art. Since the 70s, many weaving companies began marketing their pieces to a wider audience, selling tapestries as the more affordable counterparts to paintings. One company that successfully merged the two was Modern Masters Tapestries. 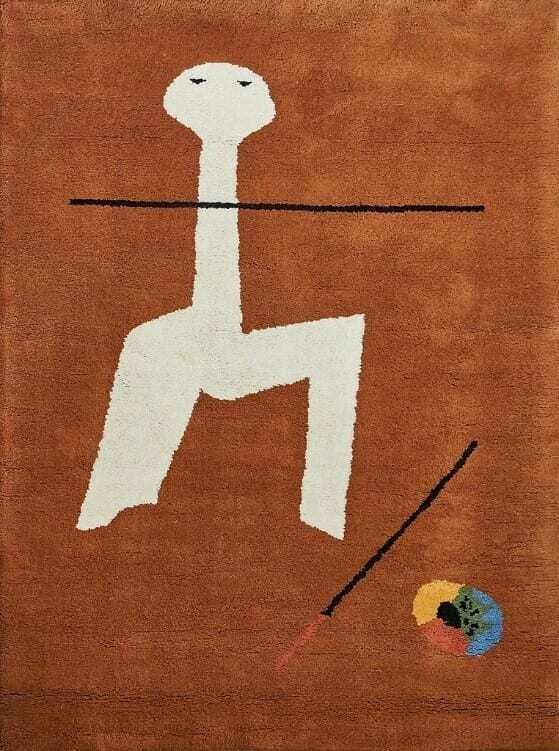 Modern Masters created large-scale reproductions of modernist paintings by artists including Joan Miró, Willem De Kooning, Fernand Léger, Piet Mondrian, and Pablo Picasso. Modern Masters enlisted artisans to create tapestries that would find their way into commercial spaces and homes. Like the designs and motifs of the paintings created by these modern artists, the tapestries imbued color and personality in each room at a much lower cost than original paintings. People who wouldn’t normally have the means to afford a modernist painting could still have artwork reflective of their tastes. 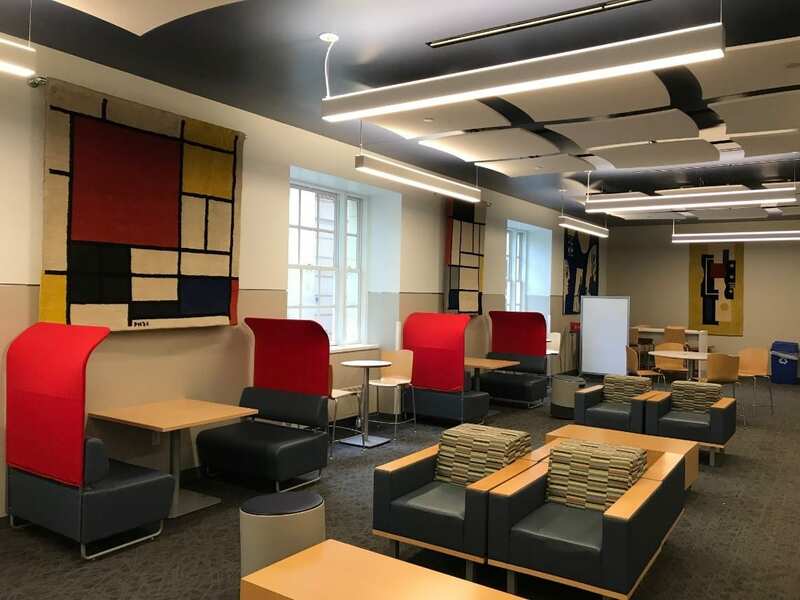 In Ruth J. Katz’s 1970s article on tapestries, she describes how textile design grew in popularity due to architects and designers finding new ways to incorporate textiles into both corporate and public spaces. Aesthetically pleasing designs and accents were no longer reserved for private spaces. The other spaces people frequented each day grew to feel like extensions of the home. Phyllis Lynn, former curator of the art collection of Manufacturers Hanover Trust Company describes the effect of fiber, “Fiber humanizes modern architecture…It softens all the hard edges and makes an atmosphere cozy.” The tapestries in Fondren Library do just that: they create a welcoming environment for students and visitors, making a normally bare, institutional space feel like a warm gathering space. The tapestries are also significant in that they may act as an introduction to modern 20th-century artists. Rather than existing in a gallery space, the tapestries hang in a common area where people converse, study, and move through. They do not need to go out of their way to view artwork; rather they may live with it, incorporating artwork into their everyday experience. Thirteen of the Modern Masters tapestries originally found their way to SMU as a donation in the 1970s to the SMU and were installed in DeGolyer Library. 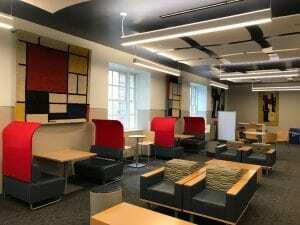 Recently, the tapestries were stored during the renovation of Fondren Library. 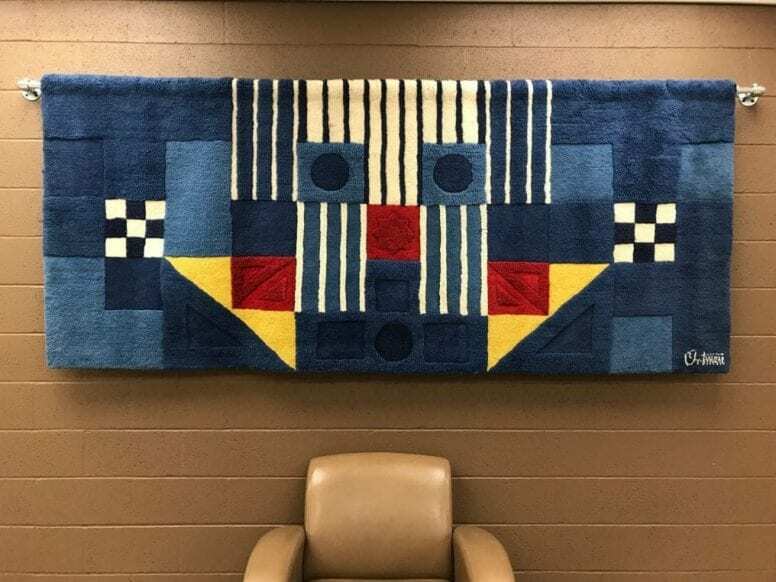 Faced with either disposing of the tapestries or finding new homes, Russell Martin, Director of the DeGolyer Library, shared pictures of the tapestries to then Interim Director of Fondren Library, Jolene de Verges. She contacted the Collections Manager at the Meadows Museum, Anne Lenhart, and together they found new spaces in Fondren to install them. 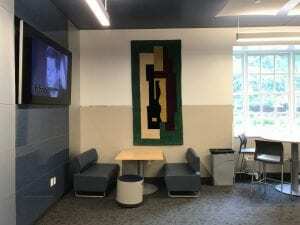 Thus, the Collaborative Commons and other areas in Fondren are the newly enriched home to these tapestries. Grant, Daniel. A Good Yarn: Artists’ Tapestries Are Popping Up in Museums, but They’re Not Yet Woven Into the Market. August 20, 2013. Katz, Ruth. The Swiftly Growing Field of Tapestries and Fiber Arts. 1981. https://www.nytimes.com/1981/02/05/garden/the-swiftly-growing-field-of-tapestries-and-the-fiber-arts.html.